Each of our houseboats has a cook and a caretaker who work for you during your entire stay. All of our houseboats have an attached boat that is placed under your command. These small paddle boats can take you out into the open lake or take you across on your way for any sightseeing. We definitely know that once you visit and experience us, you would always feel yourself back in your home. 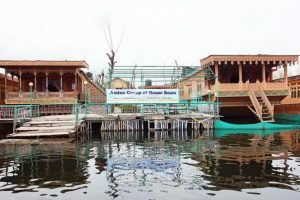 Amina Group Of Houseboats offering guests wide range of facilities and services Today Amina Group Manages a Fleet of 11 Luxurious Houseboats which includes Super Deluxe / Premier Houseboats in Dal Lake. With our Professional Management of International Standards, we ensure to take utmost care of the Guest who stays in our Houseboats.